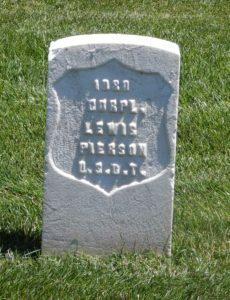 Lewis Pierson (sometimes spelled Louis Pearson) was born in Shelby, Kentucky about 1837. By 1860 he was living in Danville, Indiana with the Atty. James M. Gregg family. He had no occupation listed and was unable to read or write. On July 4, 1864 Pierson enlisted in Company G US Colored Troops 28th Infantry in Indianapolis, Indiana. He was mustered out on November 8, 1865 at Corpus Christie, Texas. He was described as a farmer, 36 years old, 5 ft 9 in with black hair and black eyes. He appears in the Indianapolis City Directory starting in 1879 as a barber and continued to follow that profession. He applied for a pension in 1890. 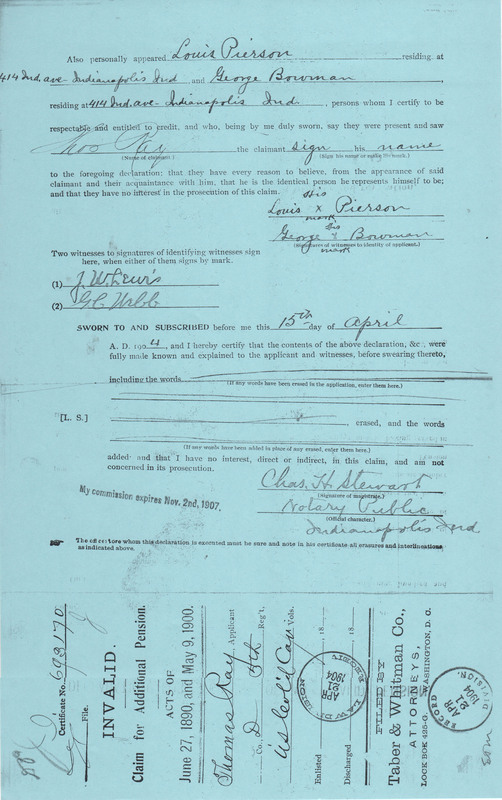 In 1904 he testified at Thomas Ray Allen’s pension hearing that Allen was who he claimed to be. There were more USCT from Kentucky than from any other state, aside from Louisiana. I could not find him in another census until 1900 when he was a lodger in Mrs. Jennie Sanders house on Center Street. He and Mrs. Sanders shared quarters at several different addresses from 1900 to 1907. She worked as a laundress while he continued barbering. Neither one was able to read or write. On December 7, 1907 Lewis Pierson died of pulmonary tuberculosis at home. His father’s name was given as Dock Pierson. No name for his mother. Mrs. Sanders was the informant. I wondered if Mrs. Sanders was Lewis Pierson’s sister, but not knowing the mother’s name made it seem unlikely. He was buried in Crown Hill Cemetery. 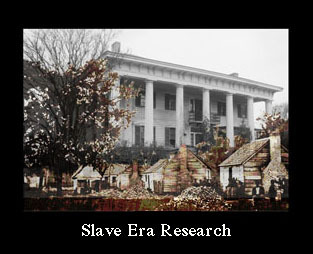 The information for this post came from records found on ancestry.com and Thomas Ray Allen’s pension file. Kristin, interesting. First time I have seen a claim for an I valid pension. Was this part of a larger pension file? It says “claim for additional pension”. 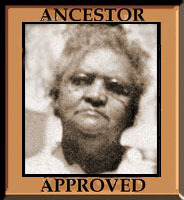 I am a Pierson descendant my Pierson ( every now and then Pierson) lived in Morganza, Pointe Coupee, Louisiana in 1900. My maternal great-grandfather Edward Pierson spent most of his life in New Orleans. Meant to say every now and then Pearson. I guess that was usual then, those two spellings. This page is just one in the larger pension file. 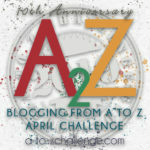 I am sharing different pages with testimony from different people for the A to Z Challenge. Today was the day for “P” so that is why I highlighted Pierson. He was not related to me, and all I know is that he said he was born in Kentucky and then he was free in 1860 in Indianapolis. I am getting sort of rushed doing these profiles everyday and if I wasn’t, I would have tried harder to find him in Kentucky or at least investigated who the white family he was living with in 1860 was and if they were connected to KY in some way. That pension file is the source of a marvellous lot of information. Your comment about completing profiles implies that you are doing this as the Challenge progresses. I would have expected that you had prepared posts well in advance. Or I have I misunderstood? I am doing them as we are going through the challenge. I had about 2 finished when l started. I had completed some of the research. I had good intentions of doing posts in advance but am writing as I go too. Many were partially drafted. Yes, and then I decide to just look for a few more things and end up, sometimes finding new information, but also spending the whole day sitting at my computer. You said Mrs Sanders might have been his sister, but I immediately thought maybe that had some other sort of affair going on. Sure, she was a missus, but maybe a widow? Doesn’t sound like there was much info on her. I thought of that first. Just wanted to check and see if she might have been his sister. I couldn’t find her before they were living together. She was a widow, but couldn’t find her with Mr. Sanders. Fascinating the processes they used to verify identify. I realise it was for a particular purpose but I don’t think we verify identity by seeking statements from unrelated acquaintances any more. This series of posts is a great insight into the people caught up in the Civil War. I really enjoy following the tale. How big was the pension file? The file is over 100 pages, about 1/2 inch when I squeeze it together and measure.